These are thin, crisp, buttery and exotic with caraway seeds. They may easily be made without a mixer; simply use a wooden spoon or your bare hands for creaming and mixing. Adjust two racks to divide the oven into thirds and preheat oven to 350 degrees F. Line cookie sheets with parchment or foil. In the large bowl of an electric mixer, cream the butter. Beat in the sugar and then on low speed gradually mix in both of the flours scraping the bowl as necessary with a rubber spatula and beating only until thoroughly mixed. Dust a pastry cloth and a rolling pin (if you have a stockinette cover for the pin, use it) with either white or rye flour or with untoasted wheat germ (see Notes). Do not use any more flour or wheat germ than is necessary to keep the dough from sticking. Roll half of the dough at a time, rolling it to 1/8-inch thickness. If the dough is too sticky to roll, from it into a ball, flatten slightly, and let stand on the floured pastry clot for 30 minutes to 1 hour before rolling out. Cut with a plain, round cutter about 2½ inch cookie cutter. Then, with a very small round cutter, about ½ inch in diameter, cut a hole out of each cookie (see Notes). The hole should not be in the center of the cookie; it should be about ¾ inch from the edge. (In place of a very small round cookie cutter, use either the wide end of a pastry-bag decorating tube or a thimble.) Reserve the scraps and roll and cut them all at one time in order not to use any more flour than necessary. With a metal spatula, transfer the cookies to the cookie sheets, placing them ½ inch apart. Using a soft pastry brush, brush milk all over the top of each cookie and sprinkle it with a moderate number of caraway seeds. Bake 12 to 14 minutes, reversing the sheets top to bottom and front to back to ensure even browning. Bake until the cookies are lightly colored. With a wide metal spatula, transfer the cookies to a rack to cool. Notes: Since rye flour is too course to be sifted, it must be strained to aerate it. With your fingertips, press it through a large strainer set over a large bowl. The part that doesn't go through the strainer should be stirred into the strained part. Rye flour and untoasted wheat germ are both available at health-food stores. Traditionally the hole in these cookies is off center. You could cut them out with a doughnut cutter and have the holes in the middle, but then the cookies would not have their classic and charming look. 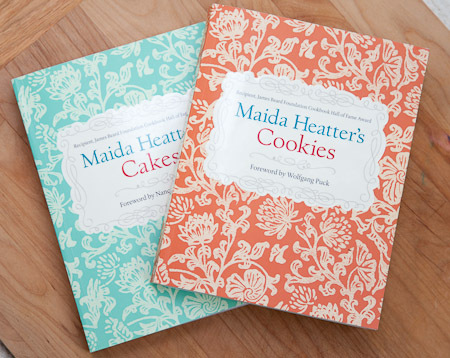 Reprinted with permission from the book Maida Heatter's Cookies by Maida Heatter. Copyright © 2011 by Maida Heatter. Published by Andrews McMeel Publishing.